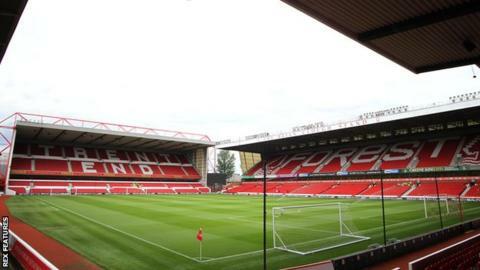 Nottingham Forest's City Ground has been restored to its full 30,445 capacity following a safety review by Nottinghamshire County Council. The council had reduced the capacity to zero in July as the club did not have a safety certificate holder at the time. "We're pleased with the progress that has been made," Robert Fisher, the council's group manager for Emergency Planning and Registration, said. A crowd of 23,012 attended Forest's 4-3 win against Burton Albion on Saturday. Meanwhile, Forest head coach Philippe Montanier says his side will need to play "the perfect game" to get a result at Brighton on Friday. "Brighton are one of the best teams in the league. It's a good challenge for us in our first away game," he told BBC Radio Nottingham. "They are a very dangerous team because they can defend very well but with the ball they are very skilful. "To have a good result over there we need to play the perfect game. They have very good organisation and good technical level with the ball. They attack in numbers."